Prefacing today’s post saying I appreciate and even look forward to constructive criticism. Deep-rooted in me is a competitive strive to be the best version of myself, so constructive criticism is welcome. I value relationships hugely, so when someone tells me I am being rude, that’s a bigdeal. I want people to value and enjoy interactions with me, not walk away feeling I thought less of them. As much as I want constructive criticism, it must come from a place of empathy. The man might not have realized my neck injury over the last weeks, but surely, he would have noticed me articulating my neck with a known chiropractor. Meanwhile, knowing how important the gym was to me and my normal “do not talk to me, I’m focused” attitude was heightened. A probing question would have put us both on equal footing with a bit of empathy for what was going on. Though there are clues that would indicate my focus and temperament, I do what I feel is needed that I best for me (i.e. earbuds in, focused look, on a timer). However, all of my actions can be interpreted differently by others. I have to be cognizant and comfortable with how I act, why I act, and what others may perceive. Constructive criticism is great, but it can be tough deliver effectively. I completely agree with the man on how facing people while talking is respectful; while not doing so is rude. I also agree that I probably have done this quite a bit recently. However, I also felt annoyed and misunderstood due to what I knew I wanted – to heal, to recover, and to still challenge myself physically. Days after this reflection, I can’t say I have changed much in how I approach my workouts. I’m still intensely focused. If someone walks up to me, I will face them. Though, if my watch beeps telling me my rest period is up, I will need to speak up and let the other person know I need to keep going. It’s the truth, and I hope s/he will understand. Also, it’s great when I have people around me who will give me constructive criticism. It shows I have people around me who care and want me to be my best self, too. 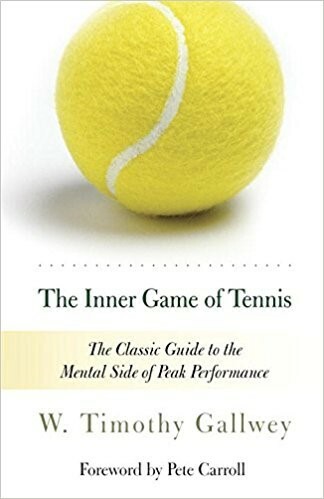 I just finished the book the Inner Game of Tennis by Timothy Gallwey. 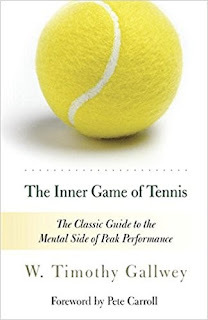 It’s a classic – expressing the key to developing mental fortitude using tennis as the vehicle. I was intrigued about the book after Tom Brady cited it as a key reading for him in developing mental strength. This was cited in an interview after Brady orchestrated the largest comeback in Super Bowl history, coming back from 28-3 to defeat my Atlanta Falcons 34-28. Being a competitive athlete (less so on a team these days and more in “self” settings) and an entrepreneur, developing mental strength is an ongoing practice. The pressure athletes like Tom Brady and great entrepreneurs face on the brink of failure (listen to any number of episodes of NPR’s “How I Built This”) is astonishing. Being able to keep going and overcome obstacles and have ­grit is hugely interesting to me. Self 1 vs. Self 2. Gallwey points out the inner battle between the mental (Self 1; read: mind) and the “human” side (Self 2). A good illustration of this is when striking a ball with the racket, the human body and brain are smart moving in a way to strike the ball. However, when the ball is not struck well, a player can be frustrated – yelling at himself to strike it better. From here, the player’s mind (Self 1) is now in control with much focus on how to strike the ball which only motivates the player to keep thinking too much about how to strike the ball. This prohibits the natural learning process of the body & mind (Self 2) to make the right adjustments. The “natural self” (Self 2). Gallwey points out how each person is the perfect version of himself or herself. However, the mind gets in the way trying to be “better”. The natural self, however, knows how to improve. Gallwey points out how young children learn how to crawl, walk, talk by themselves. Children’s minds do not interfere and try to teachthe body how to walk. Instead, the body moves, learns, adapts, and tries again. Reviewing the self. As a tennis instructor, Gallwey used to instruct his clients how to swing. Most of the time, however, players would already know what they would need to do. They still did not do it. Then, Gallwey instructed players to watch their reflections in how they strike the ball. The players watched and realized how they should swing their rackets – it was not any different from what instructors had said. However, this gave clients the ability to self-assess and visualize the proper way of swinging. No other coaching was needed. Their movements would improve on their own. I appreciated Gallwey’s book identifying Self 1 and Self 2. Unsure if there were many more take-aways that others would get out of the book. However, my focus points were about the need to bifurcate the mind from what the player (the true self) knows what to do. Overthinking is all too common which can paralyze the player. In everyday practice in the business world, this appears when I, especially, can get caught up in how to perform sales calls. I know what I need to do, but developing and sticking to specific scripts makes me overthink. This, then, prohibits a natural conversation with prospects. Check out the book, and see what you pick up. I’m sure you will also focus on Self 1 and Self 2. However, there may be other lessons from the book that resonate deeper than the concept of the bifurcated Self. A good way to tackle a new business idea is to think about the objections. That is, think about why problems exist today – what are their hurdles? Why hasn’t this idea been developed already? How is this problem being addressed today, and how did the market get here? How can these challenges be overcome? Addressing these challenges (read: objections) is similar to approaches in brainstorming methods such as the Disney way and Six Thinking Hats. When you ask these types of questions, you might find out macro trends are removing hurdles – maybe, then, it’s great timing for success. For Instagram, for example, anyone with a smartphone almost instantly became talented photographers. For Instagram, the technological evolution of cameras in smartphones lowered the barrier for general consumers to have “good” cameras. Instagram capitalized on this opportunity further by providing filters. These filters enabled everyday photographers to alter and beautify pictures, much like professional photographers could do before. Addressing how traditional models operate has made countless companies successful – finding ingenious ways to alleviate the shortcomings of today. They addressed and removed barriers that held back huge markets from capitalizing on huge potential. In fact, an accelerator program here in town challenges its startup cohorts by pointing out the reasons why the startups will fail. It’s up to the startup, then, to address those challenges – removing the objections of why a buyer would not buy – turning objection discussions into must-haves. Think about hurdles. Think about the objections – why do these hurdles exist today? How can entrepreneurs move them? I overheard a discussion between two execs recently about the idea of working closer together. One exec was pitching another way to earn incremental revenue from existing customers. Except, the conversation stopped there – regarding more revenue anyways. Instead, the execs shifted focus to discussing how working closer together could add “delight” to customers. It’s hugely telling when an entrepreneur pauses a discussion to shift the focus away from “more money” to “more delight”. Here, the entrepreneur understands the importance of thinking about the customer-first. Here, the entrepreneur understands the importance of creating emotional value. Thinking revenue-first means thinking about the company first. However, the company does not exist without its customers. Thinking customer-first puts the company on a path to bringing customers in and retaining them [especially against competition]. When thinking about the services and products you can’t live without today, think about the ones that you wouldn’t leave the brand. Think about how delight surrounds your decision to use that service or product. Think about the people you surround yourself with, and how your interactions together are delightful. Think about how driving customer deliver shifts how employees engage with the company mission. Think about delight. Think about customers first.